What I miss most about summer is the bounty of local fruits and vegetables. Thankfully I can hold on to that summer feeling through my cooking. 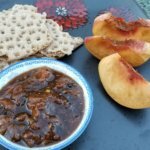 Like this delicious peach chutney that has become a family favourite; it works beautifully as a dip or a spread. It feels like summer was a long time ago. Time flies with kids around and I blinked and we are well into autumn. Every year a big part of our summer vacation is spent visiting my family and friends in India, and this year was no different. It’s a lot of fun reconnecting with our roots and I usually return feeling energized – it’s as if my brain reboots. Ctrl Alt Delete. The only downside of spending the summer in India means that we miss a lot of the warm weather in Canada. By the time we return it’s the end of August and the atmosphere is shifting to the coolness of fall. What I miss most is the bountiful supply of fruits and vegetables. So I try and hold onto the season a little bit longer through the kitchen and my cooking. My daughter loves peaches. 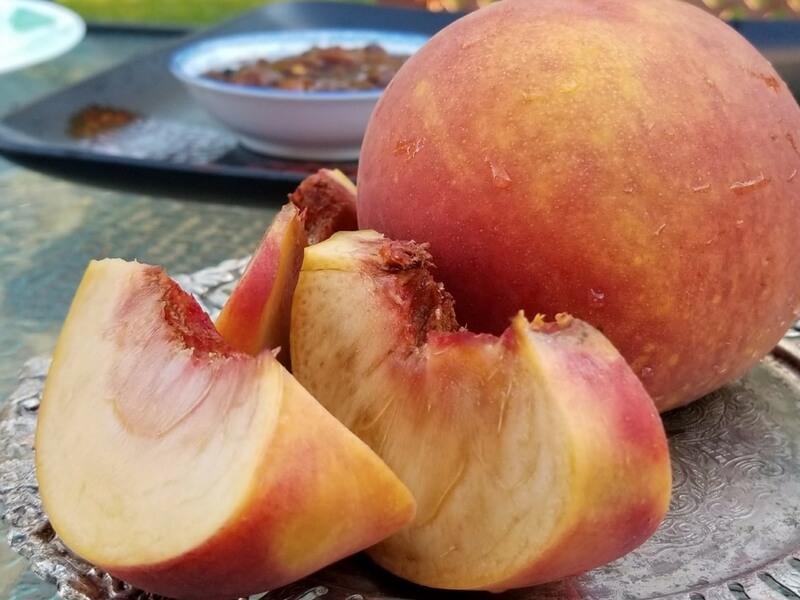 Fuzzy and ripe, they are a treat in the summer and I usually buy flats of peaches because that’s how many we can run through every week. But I also hate wasting food and letting it go to rot. Wilted, browning fruits on the counter? Fruit chutneys to the rescue! The one the left is fresh and tangy and made with a combination of herbs and savoury spices. It has a shelf life of 3 days in the refrigerator. Sometimes there’s coconut or tomatoes, or my favourite – a combination of cilantro and mint with a sparkle of lemon juice. Every home has its own recipe and tweaks, and you’ll find it served alongside other dishes to complement the warmth of Indian food. 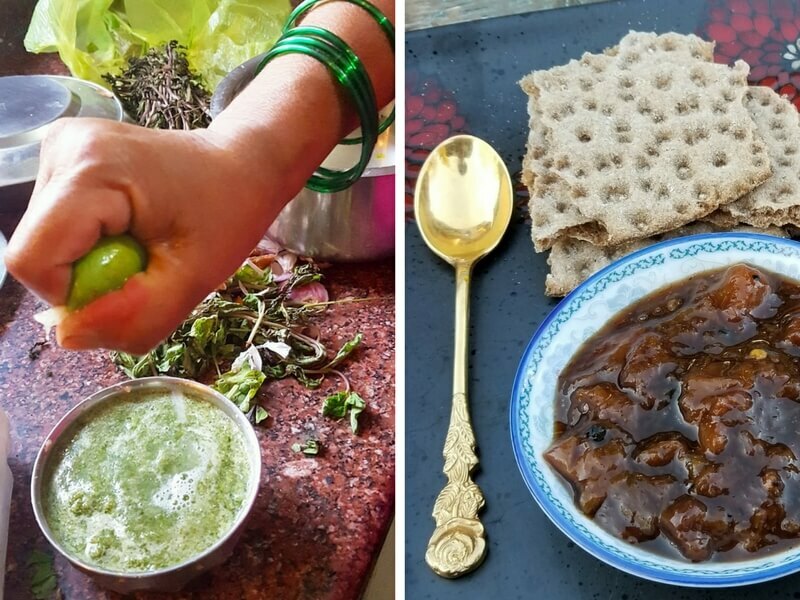 The other type of chutney – on the right in the picture – is inherited from India’s colonial past, and is sweet. It is usually made with fruits as a way to preserve the fruit well after the season is over. It goes well with spicy food, or inside a grilled cheese – whatever you prefer. My mom makes a mean tomato chutney that will rock your world. But today it’s all about the peaches. Fresh and fuzzy, or wilted and on their last legs – this fruit works beautifully in a chutney. 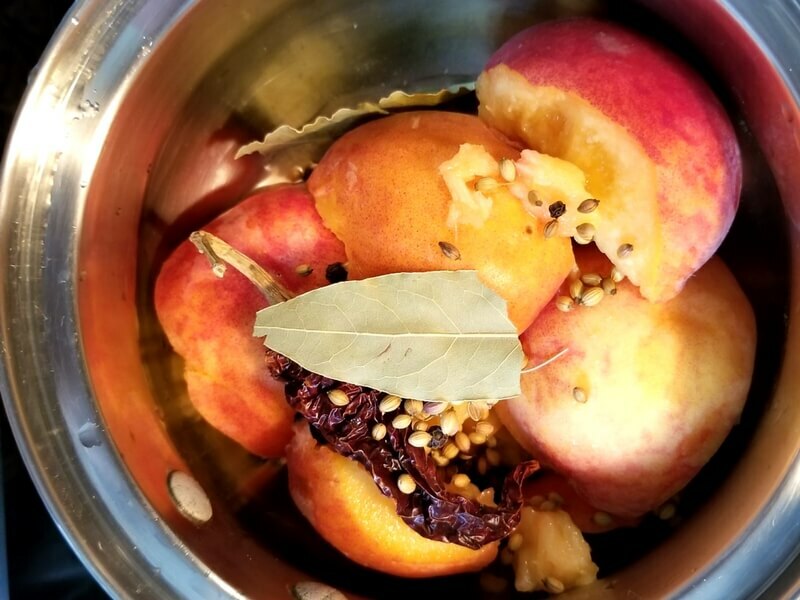 It’s easy to work with and with this forgiving recipe you end up with a pot of aromatic goodness that will remind you of summer long after the warmth has faded. Like many of my other favourite dishes, this recipe is also very forgiving. See below. You can use brown sugar or white fine sugar or cane sugar. The flavour is slightly different but still delicious. My preference is to use darker sugar for a more robust flavour. The recipe needs some heat. I add a red chilli pepper along with a green one. I take the green chilli out halfway through the stewing to temper the heat. I prefer to use rice wine vinegar for its more mellow flavour. You can spoon this into jars and refrigerate for up to one month. Mine doesn’t last that long – I’ve already made three batches since summer ended, and it’s only October. That’s how good this is. 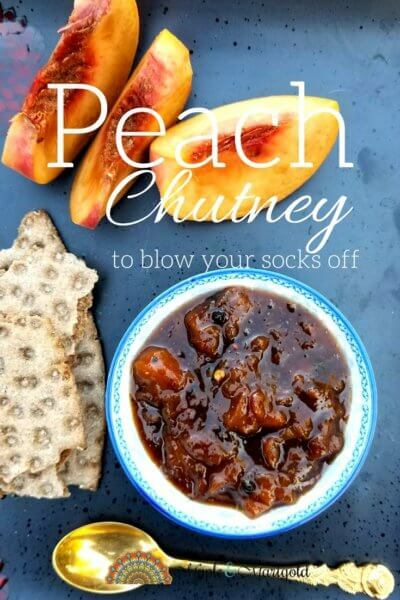 A peach chutney recipe to blow your mind. Add in all the ingredients. Cover and cook on med-high for 5 mins. Toss every minute till the peaches soften. Turn the heat to low-med heat and cover and cook for the next 25 mins. Stay around to watch for over caramelization of the sugar. You may need to adjust the heat. Serve with your next meal and revel in the glory. Not kidding!